This post on defending pick and roll was sent to me by Nate Hill, Assistant Boys Coach at Colonel Crawford High School in North Robinson Ohio. He has coached for 18 years from 7th grade through Varsity Head Coach. Nate has contributed several articles for the site. Coach Hill said: I typed this up while preparing for our next opponent who runs lots of ball screens. These are 5 different ways I’ve seen the pick and roll defended. Pretty basic stuff, but it helped me out going through the different strengths and weaknesses. He started a Coaching Newsletter this past Fall. Here is a link to the archives if you are interested. X5 chests up 5 and tries to JAM screener. 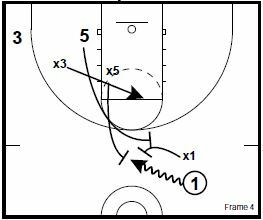 X5 steps out and HEDGES screen, forcing the ball handler to change direction. 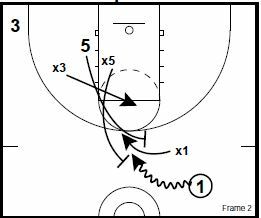 X5 must then sprint back to 5. X1 fights over top pick and stays in 1 hip pocket. X5 jumps out in front screen and takes x1, x1 now guarding 5. Give up: this can create mismatches with guards / posts, slips off screens, and screeners rolling to post and posting up, post players defending guards off dribble. x5 and x1 jump into lane and try to trap 1. 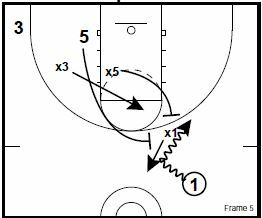 Give up: pick and pops, slip pass, passes over top screen with bigger guards, slow rotations. Teams can make a pass out of the trap, and a quick extra pass to open players with good spacing. Take away: good shooters and drivers, forcing 1 to make solid pass, and 5 to make a shot / play. Forces players to make passes with weak hands. X1 jumps on topside of screen making 1 refuse the ball screen. 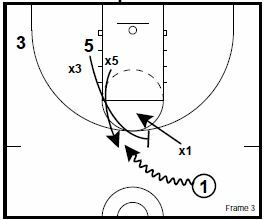 X5 helps on the DOWN / ICE call and they can trap or hedge the ballhandler. X3 helps on the screener. This is very common on side pick and rolls in the NBA. 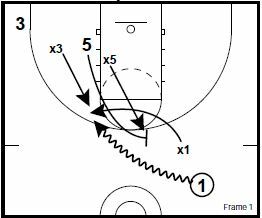 Give up: Screener rolling to basket / slips, midrange jump shots for screener, passes to ballside corner. Take away: forces the midrange pullup or jump shot. Can force players to use weak hand. This is not used very much at the high school level. Though not pictured, let’s assume there is an X4 guarding 4 in the ring wing/corner. In all cases pictured in the article except Down/Ice, X4 is the guy we would want to help/bump the roller 5. The reason is 1 is heading left off the ballscreen, he can look and see right in front of him that X3 has left his man. 1 can simply hit 3 for the right corner three. X4 is the guy because 1 is looking the opposite way, and since 1 is heading left, X4 is already incrementally moving towards help in the lane and would be nearer to 5 than X3 to help/bump 5 rolling. X4 coming from 1’s “blind side” is also ideally suited to steal a pass from 1 to 5 if 1 is trapped by X1 and X5.